Just A Brit at Heart! I joined Netflix when I realized that I couldn't get all of the seasons of A Fine Romance with Judy Dench anywhere in Bellingham. I had fallen in love and couldn't stand not seeing the rest of them. So, one of my kids suggested that I join Netflix for a free month until I finished the whole series. Of course, she knew I would be hooked. I was astounded by the ease of using Netflix. You put a movie into your queue and when one video was finished and in the mail, you had the next on your doorstep within a day. I have no idea how they can be so reliable given the peculiarities of the mail system. But, they can! I put a video in the mail on Wednesday, they receive it on Thursday, a new one is in my mailbox on Friday without fail! I began paying for two videos per month as soon as the free trial was up. I couldn't believe all the delectable British series I had at my fingertips. That was a few years ago, and the other night I counted how many series I have watched to date and came up with 32. Since each of the series runs from 2 to more years, you can multiply the number of series years (hmmm, let's say an average of 4) by the number of episodes per year (let's say 6) and you see that I have watched a good many programs. Of course, I had to watch all the Judy Dench such as A Fine romance and then went on the the Vicar of Dibley and the whole course of Upstairs Downstairs. I enjoyed Rosemary and Thyme, the Monarch of the Glen, and Ballykissangel among others. After visiting Woodland Hills and having lunch with Signe, Peggy, and Mary, I came home loaded with other titles I didn't know such as the House of Elliot. Sometimes I try one and don't get hooked so I drop it off my queue. There are other series, such as Lovejoy, that I enjoyed more than others did. I don't just watch one series at a time, but space them out on my queue interspersed with two or three others. I'm still going through Hetty Wainright, Foyle's War, and Murdoch although he is actually Canadian and not British. I keep up with Poirot and Doc Martin by watching PBS instead of getting DVD's from Netflix which was how I began watching Foyle's War. Maybe it is the upcoming wedding that has turned my attention to this topic. I do love the Brits. Perhaps it is because it is my heritage as my mom was born in England. I love to discover new series and scan the Acorn catalog and depend upon my friends who are kindred spirits such as Barb and Larry Green to let me know what they are wathing. If I ever fulfill my lifelong dream of getting to England, I will be be in 7th heaven. It will feel like I'm in my own series. I won't even begin to mention all my Agatha Christies and Dorothy Sayers books in my study. Does this make me an Anglophile? I got up way too early this morning. I have taken James to school the past two Friday mornings because it gives Dani one day a week to avoid hauling Nico out of bed at 6:00 to get James to school by 6:30. Since I'm awake fairly early anyway, I volunteered to do the job on Fridays. I leave my house at about 5:55 to get the job done, but where do I go from there? I'd go out to breakfast, but nothing is open yet. So, I come home and make breakfast and check on my computer. It is now 8:30 and I feel like I've been up for hours. I suppose I have, but I can't believe how long the morning seems to be. This probably makes no sense for those of you who still work. I used to be at school very early. But, now that I do not have to get up at any particular time, I dawdle a lot. I much prefer that life style. Today is Good Friday and Easter is around the corner. My sister, Linda, was born on Good Friday on April 23rd, 1943. She will be 68 tomorrow. My mother said it was the latest Good Friday she could ever remember. It is light out when I take James to school, and the world feels bright as we climb out of the long and cold winter. The garden is finally inviting, and I look forward to walks around the neighborhood and through the local parks. There is nothing lovelier than the paths over the Bay in Boulevard Park or around Lake Samish. This is truly a beautiful part of the country at all times of the year, but the blue skies of spring and summer and the lovely flowering trees, the azaleas, camillias, and rhodies which bloom their hearts out, simply take your breath away. I'm glad this late Easter date coincides with all this new life. I don't know what it is like to be hungry or poor. I don't understand how it feels to be homeless or live in deplorable circumstances. But, I hope that no matter what circumstances people find themselves, they do not lose the ability to look around them at the natural world and experience some hope of new life or peace for themselves even in the midst of their troubles. Last fall I put a large pot away in my garage after pulling out the annuals that had died. The pot sat all winter looking forlorn and lifeless. A few weeks ago a little green shoot began to push through that crusty dried dirt. 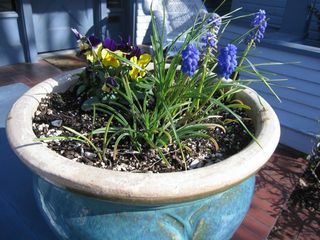 I watched it fascinated until I finally remembered a few days later that I had planted some little grape hyacinths in the pot the year before. So, I hauled it out of the garage and watered the dry soil. It was so much fun to watch those little buggers pushed through, one by one, to reach the light of spring. The living spirit is so tenacious - all it needs is a little encouragement. My Easter bring you new hope, new joy, and new life. My little scraggly, but triumphant pot! I've been reading Diane Ravitch's new book, "The Death and Life of the Great American School System." Actually, I've been reading it for months, keeping it in the bathroom and picking it up for an occasional bath or other activity. It is slower going than her previous book on the textbook problem for schools. I also watched her on Jon Stewart and was surprised to see her in person because she was nothing like I thought she would be. In any case, she has had an important voice in this continual battle about testing and school reform which seems to be more about politics than actual education. Bill Gates is spending millions on school reform as everyone knows. But, I tend to be skeptical about looking at schools from a business perspective. This wasn't helped when I saw that the way they were going to find the best teachers in the schools (so they could quantify what a good teacher was all about) was to ask the district offices who their best teachers were and then go and interview them. "When," I wondered. "Just when are they going to ask teachers who the best teachers are. Or, better yet, students and parents." I felt much better months later when Bill actually said that the research shows that asking students is a better indicator of who the good teachers are. Students actually report quite accurately (as any good teacher knows). They know which teachers are lazy, which are hard working, which teachers are fair or cut corners. Heck, they probably know much more about their teachers than the teachers even imagine. Kids are astute. And usually forthright and honest. I have been so fed up with education as I have seen it emerge in the past 20 years. Districts have become so micro-managed from the top that principals are put in impossible situations. The principals I used to work with had power in their schools and were advocates for their teachers. They often had to mediate between the central offices and the school community. Often they now appear to be mere conduits for the top down edicts from people who are once removed from the classroom. When I once suggested to a group of administrators in the district who were looking for answers on how to help kids that were failing that we might get together the best of the special education teachers in the district to ask them about strategies. I could visually see the sneers on their faces. God forbid that we should actually consult teachers who knew about failing kids. You know, the ones that had masters degrees in learning disabilities. No, we were looking for the new hottest programs on the market. It's all about the newest research - and, if you read Ravitch, you know how that can be problematic. I have two main complaints about the administration in school districts. The first is that they freak when teachers are out of classroom except when they wish to seem collaborative - at which point they will gladly release teachers to join a committee to decide on this or that. I have been on so many committees where teachers sacrifice many hours (and lots of extra work to prepare for subs in their classroom), only to come to some conclusion together and be told that it is not acceptable. You see, if the committee agrees with the district point of view, they are successful. If they come to an alternative suggestion, they are dismissed. I have even seen committees composed of teachers and parents harangued because they are not compliant. I think most teachers would rather just stay in the classroom, admit that they are employees and be told what to do without the pretense of collaboration. An employee can decide to comply or quit. But, teachers continually get drawn in to the charade and find suddenly that they are chastised because their expertise is not really valued. The second point is more subtle. And, difficult to explain. It is how we regurgitate materials without even knowing the primary sources. This means that we often misjudge what is truly important, because we have not actually read or understood the real issues. We see this in education in so many ways. Someone far off looks at a problem and comes up with a solution. We get excited about their solutions, not really understanding the original problem. A simplistic example of this is that my neighbor teacher comes up with a terrific answer to her problem of teaching reading in her classroom. I love her ideas and they have seemed to work well for her. But, without really knowing about my own situation, a person in charge decides that they will apply her solution to every other teacher in the school without knowing whether or not they have the same problem. If it is good for one, why not all? That doesn't sound so bad, does it? Except when you see how much money the schools spend on expensive bandaids for people who are not injured. And, how many times they forget that they have an entire cupboard filled with remedies that work just fine. I have great faith in teachers. They are the hardest working people I know. They are generous with their skills and they are the ones on the front line. They are certainly not lazy. And, if they have three months off in the summer (to take classes or work a second job), it is not as if they hadn't already spent the equivalent of three months in overtime. No teacher walks away empty handed from school. There are simply not enough hours in a school day to do the job. When, pray tell, can one grade papers, plan lessons, and write curriculum while interacting with 25 or 30 to 150 students or more? I had a friend once who was fired (a private school) because her class got poor grades on the standardized testing. This same class had poor grades every year -- it was the nature of that group of students. When will politicians stop blaming the teachers for not being able to teach children without the services they need to thrive? When will they look in their own back yards and begin to feed the poor and heal the sick? Then, all children will be able to learn. I've been in a writing mood the past few days. It is probably because I met with my awesome writing group the other day and it set me off. I'm working on a short story (a new genre for me) and can hardly wait to get to my computer each day. Unfortunately, I have had a list of things that I have to do, so I thought I would at least get in a few minutes of writing on my blog before I'm off to church in about 15 minutes. Dani and I went to the local bookstore's monthly radio/TV show taping last night to hear Alexander McCall Smith. He is the writer of the Ladies' Detective Agency novels that take place in Botswana. I heard him about ten years ago at Third Place Books and he is extremely witty and a great stand-up comedian. At the time, Don was a bit put off that he laughed at his own humor, but that didn't bother me. He is a jolly man, and if you can tell by his many series and novels as well as his other academic accomplishments, an extremely busy and bright jolly man! He was hilarious last night. He spoke for about 15 minutes by himself and then, later, was interviewed by a fellow Scot who teaches at Western. The audience was in stitches. Altogether a good evening. What happened before the evening was really fascinating. Dani dropped James off at a gig on Friday night and brought Nico here. We decided to go down to Mambo Italiano in Fairhaven for some onion soup for dinner. Dani had been out to lunch that day with her friend, Laura Johansen. So, we went to dinner and both pulled out our debit cards to share the cost. I grabbed the receipt on my way out. Last night, before going to the show, I sat down to record my receipts in my online checking account. While doing so, I realized that I had grabbed Dani's receipt from the night before -- no problem since we both spent the same amount. However, it didn't have Dani's name on it. It had Laura's name. I dialed Dani's cell phone. "Look at your debit card," I said. Sure enough, she had Laura's card. They were probably visiting, and when she saw the debit card that looked exactly like hers on the table, she automatically put it in her purse. When I suggested that she check the card, she remembered that she had paid cash for lunch and hadn't used her debit card at all. Embarrassed, she called Laura and 'fessed' up to inadvertently taking the card. Since I live near Laura, Dani sent me home last night with the card and the $$$$$ that she had spent on the onion soup which I then delivered into the rightful hands. If I had not gone to dinner with Dani and inadvertently grabbed the wrong receipt, if I had not sat at my computer the next day to record the receipt, if I had not actually looked at the name on the receipt before I recorded the amount--none of this would have been discovered. Laura would have had to cancel her missing card, and Dani might have charged more items to an account that was not hers. I am hyper aware of this potential problem because my friend, Marilyn Gorsuch, and I often go out to eat together. We have the same bank debit cards and, of course, the same first name. So, we have to pay close attention or risk switching the cards. It would definitely be to my advantage since Marilyn is still working and probably makes much more money than I do. Life is funny. It is funny hilarious like Alexander McCall Smith. And, it is funny peculiar with life's little twists! I like it both ways! Anyone who would actually read this blog probably knows that I love puzzles. I've mentioned them before. I usually keep a jigsaw puzzle going in my lower living room, do the NY Times' Sunday Crossword as well as others and also have a Suduko book next to my bed. Nicole, who was probably nine or so, introduced me to Suduko. She did it at school, and I'd never heard of it. I quickly became a fan. I play Scrabble on Facebook with Keith and Janet Craswell and with Dee Robinson who also beats me consistently at Word Twist. Yes, indeed, I do love puzzles. The first thing my grandchildren learn is not to bother grandma's puzzle. Little fingers and 1000 pieces means that the puzzle goes all over the floor and parts get lost. Nothing annoys me more than messing with my puzzle and every child who visits gets the message. Kids understand fast when you are serious (and look and sound mean). So, they stay clear -- until they grow up and get to share. I am very generous with sharing my puzzle with other puzzle fans. If they finish my hard work, I can always begin again and put it together myself. I don't care. It is all in fun. But, children must keep their little grubby hands off. Except for Nico!!! I have never had a grandchild who actually cares about puzzles. I finally do. The jury is still out on Lionel. Nico began with small puzzles. He can put a 35 piece puzzle together in a few minutes flat. He is slower with 50 piece unless they have colorful shapes. I've taken care of him twice this past week, and he wants to put the same puzzle together over and over. I finally went to Fred Meyers and bought new puzzles because I was bored to tears. He wants to put half together and then he wants me to do the other half. It is a big contest. He loves to be faster than me - and then to figure out how to put both halves together. Puzzles even trump television -- a complete surprise to me. I tried to divert his attention after multiple puzzle endeavors to no avail. "Please," I begged. "Can't we watch Sponge Bob?" Nope! He wanted to do puzzles instead. But, the real surprise was when he begged me to work on my big puzzle together. He wanted a chair just like mine to grace the card table. Then, he set out to find like pieces. And, he did. The kid put together about 7 pieces of an American flag. Then, he found several pieces that made a word. Then, some brick walls. I was trying to work on the puzzle from my point of view but I was flabbergasted watching him stand on the chair or climb up on the railing to the stairs next to the card table, gaze out over the myriad of tiny pieces, and quickly spy those that would match what he was doing. "Gaggi, that one THERE!!!. NO, over THERE! Give THAT one to me." He was fast and he was usually spot on! He then takes the pieces and, with great concentration, turns them this way and that to see if they will fit. I was so mesmerized that he accomplished much more than I did in the more than half hour that his attention was rapt. That kid has an eagle eye! This is the kid that would rather watch television than anything else other than running around or building Legos like his brother used to do. James always had (and still does) an uncanny spatial ability. I once bought him a three dimensional puzzle and I was sitting reading the directions. When I looked up to tell him what we needed to do, I was presented with a done deal. But, he didn't care much about my flat puzzles. He liked building structures. By the way, I never ever built another 3-D puzzle. What am I saying, I never even built the first one! Grand children are so amazing. My youngest finally has the teeth he has been working on for so long. He sat at dinner with us the other night and is now scooting backward around the apartment according to his dad. Nico is my puzzle fiend. James is a significantly busy musician, and Allie and Nicole are appearing in a production of Annie with Allie finally getting the large part that she has deserved over the years. How proud can a grandmother be?